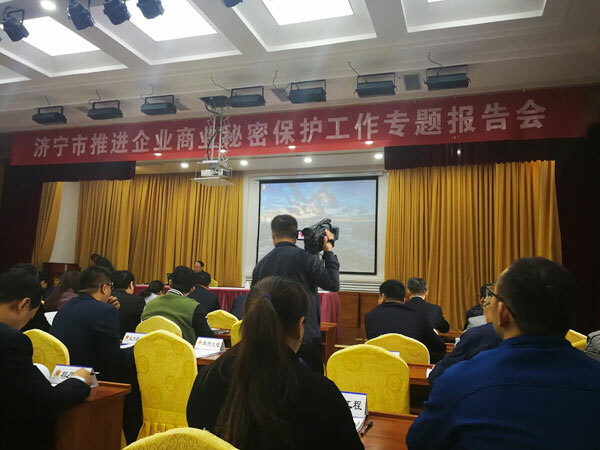 In order to enhance the awareness of corporate protection of business secrets and enhance the core competitiveness of the enterprise market, on October 26th, Jining City held a special report meeting on promoting the protection of corporate trade secrets. The meeting invited the Vice President of the China Intellectual Property Law Research Institute, Professor of Chinese University of Political Science and Law, Doctoral Supervisor Feng Xiaoqing as a special guest at the conference. The person in charge of the county and city public security bureau, the responsible person in charge of the industrial and commercial bureau, the municipal economic and trade committee, the municipal science and technology bureau, the municipal public security bureau, the municipal people's bureau, the municipal industrial and commercial bureau, the municipal intellectual property office, and the relevant business secret protection work The main person in charge of the contact point company participates in the meeting. 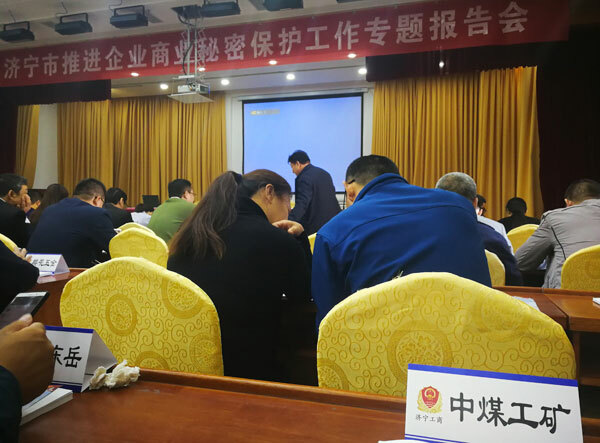 As a “510” project cultivation enterprise in Jining City, China Coal Group was invited to this meeting. Deputy general manager of the group, Fan Peigong, attended the meeting on behalf of the group. Trade secrets refer to technical information and economic information that are not known to the public, can bring economic benefits to the right holder, are pragmatic, and are protected by the right holder. It includes information on design, procedures, product recipes, etc. At the meeting, Professor Feng made a special report on strengthening the protection of intellectual property rights and raising awareness of corporate trade secret protection. He pointed out that many enterprises have perfect protection measures for trademarks, patents and other intellectual property rights, and have standardized protection procedures. For the protection of trade secrets, enterprises pay more attention to infringement means and passive prevention after the occurrence of infringement, but they lack a good understanding of their own value. He pointed out that trade secrets should become a kind of corporate culture, and they need to be classified according to their importance in daily work, so as to clarify the contents of trade secrets that they need to protect before infringement disputes occur. At the meeting, the participating entrepreneurs also conducted in-depth exchanges and discussions with experts on the protection of trade secrets encountered in the development of the enterprise and the violation of trade secrets experienced by the company. The experts gave answers one by one, and proposed a more suitable Jining enterprise from the aspects of improving the awareness of corporate trade secret protection, establishing a sound protection system, following up and implementing protection measures, strengthening personnel training, optimizing the retention of talents, and promoting pilotization of classification. Practical opinions and suggestions for development. Mr. Fan said that the protection of trade secrets is directly related to the survival and development of enterprises. The special report will further enhance the enthusiasm of enterprises for the protection of trade secrets, provide professional guidance for the protection of corporate trade secrets, and help enterprises develop. Next, China Coal Group will actively cooperate with the industrial and commercial and market supervision departments, strive to establish and improve trade secret protection measures, build a protection system, and enhance protection capabilities, and scientifically develop a trade secret protection system to better enhance the core competitiveness of our group's market!